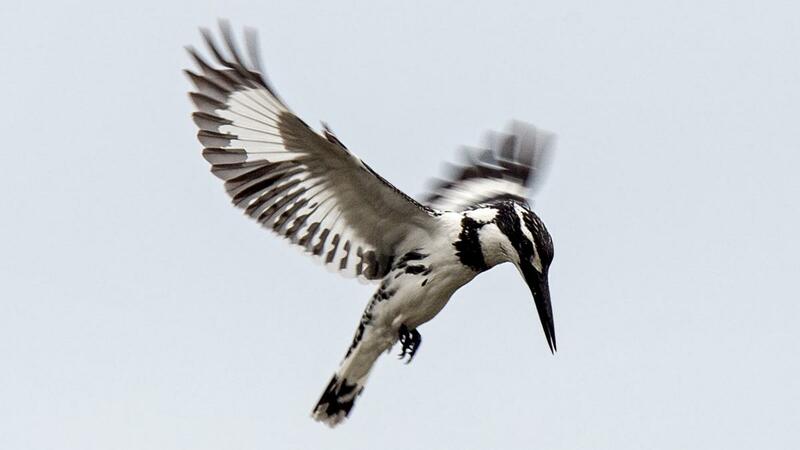 Pied kingfisher, hovering. Photo: Andy & Gill Swash, WorldWildlifeImages.com. The foraging flight of the kingfisher is the well-known inspiration for the Japanese Shinkansen high-speed bullet train. The shape of the beak is thought to help reduce aerodynamic and hydrodynamic drag as the bird dives from metres above the water, piercing its surface in pursuit of prey without creating a ripple. While much is known about the engineering principles behind the drag-reducing shape of the front of the bullet train, its biological inspiration remains unstudied. 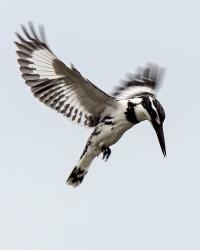 The foraging style of the pied kingfisher is an extreme form of animal locomotion paradoxically involving both hovering and high-speed diving. The kingfisher hovers over the surface of the sea for extended periods of time. Such hovering is costly, energetically well above that of an Olympic athlete’s 100-metre sprint, and kingfishers, being much larger than hummingbirds, are thought to be above the physiological size limit for sustained hovering. The subsequent dive at high velocity encounters large deceleration when hitting the water, similar to a human high dive into a pool of maple syrup. Dives, then, must be performed with precision to avoid damage and successfully capture prey. Nonetheless, kingfishers are a highly successful group of birds – with the pied kingfisher found abundantly across Africa and south-east Asia. This project will examine the biomechanics and physiology of the kingfisher dive, illuminating how hovering is achieved in a large bird, and the specifics of precise water entry. High-speed videography will enable us to track the motion of wild birds to learn how the bird controls the aerodynamics and hydrodynamics of foraging. Multiple synchronised high-speed cameras coupled with technology similar to that used by animation studios will allow us to digitally measure and reconstruct the motion of the wings and body of the bird in three dimensions. This level of detail will reveal the specific motion patterns the birds use to control hovering and diving. We will also sample longer periods of activity, to construct an energetic framework for how difficult dives fit into the ecology of the animals. Birds will be given tiny waterproof backpacks containing GPS units and accelerometers (much like a smartphone), enabling us to measure the relative frequency and repeatability of dives over several weeks, and the timing of these dives relative to external factors such as wind and weather. By combining detailed biomechanical approaches with broader-scale physiological measurements, this work will further our understanding of an unusual but highly successful flight strategy.